If we look at the world we live in with the eyes of the dominant culture, which is hard not to, given the all-pervasive nature of information dissemination, we will see a society in rapid change, with ever-shifting values. This makes it difficult to know where, and who we are, where we are going and even where we have come from.While the whole world seems to be swept along on a hurricane of delusion and deceit, the Muslim who stands by what Allah has revealed to him through His beloved Rasul, sallallahu alayhi wa sallim, remains firm like a mountain. Whatever comes to him, he always washes and stands before his Lord five times a day. He does as commanded and avoids what is forbidden. The degree of his firmness is his holding to the Shari’ah following in the footsteps of the Prophet and his companions. It is this that maintains his sanity, gives him discrimination and makes him a light to others. The power of the Salah is in its relentless continuity, which we do come rain or shine until we die. Along with this daily gift from Allah comes the annual generous month of Ramadan, the two main elements of which are the Qur’an and fasting. with Clear Signs containing guidance and furqan. Any of you who are resident for the month should fast it. But any of you who are ill or on a journey should fast a number of other days. Allah desires ease for you; He does not desire difficulty for you. This is not only because it is said by the mufassireen to be the night when Allah revealed the Qur’an to the Prophet, but it maintains a particular significance each year and they say in commenting on the ayah which mentions the sending of the angels and the Ruh by Allah with all the commands, that this means those commands that He has decreed for the succeeding year. This extraordinary night is imbedded in this wonderful month, when all the shayateen are locked up and the gates of the Fire are closed. So prepare for the month and watch for the night, because it is a critical night of the year and not to be treated like any other. The Fasting, Tarawwih, further study of Qur’an and extra acts of ‘ibadah will help prepare you to recognise it and celebrate it. You must desire to taste it and to be among those who call on Allah during its blessed passage until dawn. To fast the month of Ramadan and miss the Night of Power is for the heart like not paying the Zakatul Fitr is to the acceptance of the Fast. Of course those who use the nights during the rest of the year for coming closer to Allah already have a head start on this special night. May Allah make us among those blessed ones who are occupied with Allah when it comes around. Ameen. Siyam like Salah is Fard, which means we have no choice in observing them and this is how Allah has decreed it in His wisdom, but it would be foolish of us to observe Ramadan solely as a duty. Ramadan brings deprivation for the body and life for the heart, and the more we are attached to our bodies and their demands the more we experience deprivation. The doing without of Ramadan is in order to enliven the heart so that it may more readily hear the message of the Qur’an. Ya Allah prepare us for Your blessed month, and give us the benefit of it and make us among your worshippers on the Night of Power. Ameen. Makkan. It has 5 ayats. and it was sent down after ‘Abasa. People disagree about the Night of Power and say sixteen things. It is that it is the the 21st of Ramadan, the night of the 23rd, the night of the 25th, the night of the 27th, and the night of the 29th. These are five statements about the odd nights in the last ten days of Ramadan according to the statement of the one who begins to count them from the first ten. However, some begin to count them from the end of the months and so make the odd night the 30th because it is the first, and the 28th because it is the 3rd, the 26th because it is the 5th, the 24th because it is the 7th and the 22nd because it is the 9th. These are five other statements, and so that makes ten statements. The eleventh statement is that it moves around in the last ten, and it is not fixed to one particular night. The twelfth is that it is concealed in all of Ramadan. This is weak because the Prophet said, “Look for it in the last ten.” The thirteenth is that it is hidden in the entire year. The fourteenth is that it is the night of the Middle of Sha‘ban. Both these two statements are false because Allah Almighty says, “We sent it down on the Night of Power,” and He says, “The month of Ramadan in which the Qur’an was sent down.” That indicates that the Night of Power is in Ramadan. The fifteenth statement is that it was removed after the Prophet, may Allah bless him and grant him peace, but this is weak. The sixteenth is that it is the night of the 17th of Ramadan because the Battle of Badr was the morning of this night. The most likely of these statements is that it is the 21st night of Ramadan, or the 23rd, or the 27th. These three nights have come in sound hadith which Muslim and others transmitted. The most famous is that it is the night of the 27th. (We sent it down on the Night of Power) The pronoun “it” refers to the Qur’an as is indicated by the context of the words. 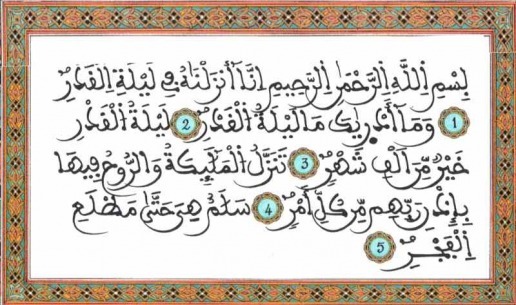 That contains an exaltation of the Qur’an in three ways. One is that He mentioned its pronoun rather than its outward name as an indication of its fame and the lack of need to mention it. The second is that He chose to send it down in the best of times. The third is that Allah ascribed its sending down to Himself. (What has taught you what is the Night of Power?) This is to esteem it. One of them said that everything about which it is said, “What has taught you,” the Prophet, may Allah bless him and grant him peace, knew, and that about which is said, “What will teach you” he did not know. The reason for the ayat is that the Messenger of Allah, may Allah bless him and grant him peace, mentioned a man of those before who had worshipped Allah for a thousand months, and the Muslims were amazed at that and thought that their lives would be too short for that, so Allah gave them the Night of Power and made it better than the worship for this long period. It is related that al-Hasan ibn ‘Ali ibn Abi Talib was censured when he offered allegiance to Mu‘awiya. He said, “The Messenger of Allah, may Allah bless him and grant him peace, dreamt that the Banu Umayya were leaping on his minbar like monkeys and he told him that they would reign over the people for a thousand months. He was concerned about that and so Allah gave him the Night of Power which is better than the kingdom of the Umayyads of a thousand months.” Then the unseen was disclosed that from the homage of al-Hasan to Mu‘awiya until the killing of Marwan al-Ja‘di, the last of the Umayyad kings in the east, would be a thousand months. (in it the angels and the Spirit descend by the permission of their Lord) Here the Spirit is Jibril, and it is said that the angels are a class of angels only seen on that night. Their descent is to the earth, and it is said to the nearest heaven. It is exaltation of the Night of Power and a mercy to the believers who pray in it. There is disagreement on the meaning of “peace”. It is said that it is from salama, and it is said that it is from the greeting because the angels greet the believers who was standing in prayer. Similarly, there is disagreement on its declension. It is said that “peace” is the mubtada’ and the predicate. This is sound whether we make it connected with what is before it or seaparate from it. It is said that “peace” is the predicate of a hidden mubtada’ which implies: Our command is peace. Or it is a word which contains “peace” and it is the mubtada’ of its predicate (until the rising of dawn), i.e. lasting until the rising of dawn. There is disagreement on the stop according to the disagreement on the declension. Ibn ‘Abbas said that His words,”it” indicates that it is the night of the 27th because this word is the twenty-seventh word of the surah.